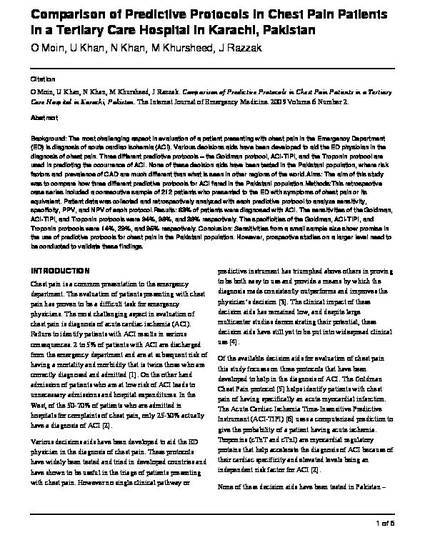 Background: The most challenging aspect in evaluation of a patient presenting with chest pain in the Emergency Department (ED) is diagnosis of acute cardiac ischemia (ACI). Various decisions aids have been developed to aid the ED physician in the diagnosis of chest pain. Three different predictive protocols – the Goldman protocol, ACI-TIPI, and the Troponin protocol are used in predicting the occurrence of ACI. None of these decision aids have been tested in the Pakistani population, where risk factors and prevalence of CAD are much different than what is seen in other regions of the world.Aims: The aim of this study was to compare how three different predictive protocols for ACI fared in the Pakistani population.Methods:This retrospective case series included a consecutive sample of 212 patients who presented to the ED with symptoms of chest pain or its equivalent. Patient data was collected and retrospectively analyzed with each predictive protocol to analyze sensitivity, specificity, PPV, and NPV of each protocol.Results: 63% of patients were diagnosed with ACI. The sensitivities of the Goldman, ACI-TIPI, and Troponin protocols were 94%, 98%, and 38% respectively. The specificities of the Goldman, ACI-TIPI, and Troponin protocols were 14%, 29%, and 95% respectively. Conclusion: Sensitivities from a small sample size show promise in the use of predictive protocols for chest pain in the Pakistani population. However, prospective studies on a larger level need to be conducted to validate these findings.